Another ordinary day on the beach, or is it? The Oyland is a made up word that means "a land that its people are not treated respectfully". 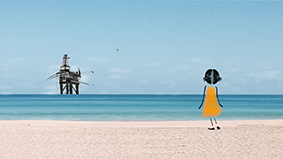 It shows the simple lifestyle of little girl in The Gulf and how her life is effected by environmental disaster.